The parish of Bergh Apton, in South Norfolk, was once two settlements, Bergh, from the Old English meaning a ‘hill or mound’, and Apton, meaning a ‘farm or enclosure belonging to Api’. There is some evidence for early occupation in the parish; Mesolithic flints (NHER 10306), Neolithic axes (NHER 10313, 10435 and 10436) have been found scattered throughout the parish. There are a number of Bronze Age barrows in the parish, most of which are clustered in the east of the parish, next to the parish boundary. The site of a possible Roman villa (NHER 10316) is in the south of the parish, close to the site of an Early Saxon cemetery (NHER 1011). Painted wall plaster, roof tile, pottery and coins have all been found at the site, but there is little other evidence for the lives of the rest of the inhabitants of Roman Bergh Apton, whose daily lives were presumably very different from those living in the villa. The presence of a large Early Saxon cemetery (NHER 1011) in the parish, on higher ground overlooking the river, suggests that a fairly substantial Saxon settlement may have been fairly close, but there is little other archaeological evidence from the period. Over sixty graves were excavated by the Norfolk Archaeological Unit, the first excavation ever carried out by them. Many grave goods, including a rare example of a Saxon lyre, were found during the excavation, although the preservation of skeletons was poor, due to the acidic nature of the soil. Bergh Apton is mentioned briefly in Domesday Book, and Saxon settlement was focused on the two villages of Bergh and Apton. During the medieval period the settlement in the parish gradually shrunk, to a scatter of farms and houses across the parish. The site of the deserted medieval settlement of Apton (NHER 11914) is to the south of Bergh, but the settlement was described by Blomefield as having been deserted for ‘time immemorial’. St Martin’s Church (NHER 10332), which was in ruins by the 15th century, leaving the Church of St Peter and St Paul (NHER 10462) to serve the parish. A medieval figurine of St Paul (NHER 10438), made of alabaster, was found hidden in a cottage close to the church, and was once part of a larger plaque depicting the two saints. 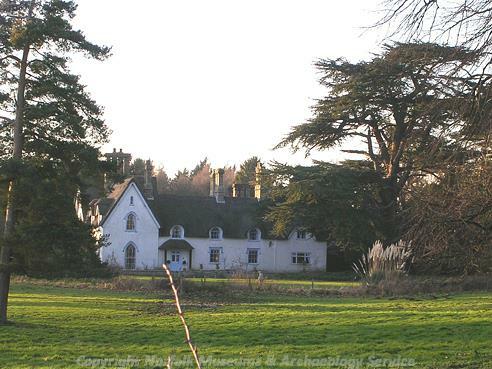 Several good examples of timber framed houses have survived in the parish, Hollylodge Farmhouse (NHER 22790) has an ornate 17th century fireplace, and Washingford House (NHER 22791), is a large brick house from the early 17th century, surrounded by what may be the remains of a medieval moat. Street Farm, or Apton Manor (NHER 12259), is a large 17th century house with walled gardens, whilst Bergh Apton Hall (NHER 22789) is an early 18th century house, with a 17th century timber framed barn. Documentary references in the 17th century to fuller’s earth pits (NHER 10317) suggest that the cloth or wool trade may have been important in Bergh Apton during the medieval period. The Old Rectory (NHER 45845) dates to the 18th century and has a central entrance with square Tuscan columns and a central first floor window with a semi-circular arched head. At the northeast corner is an attached 18th century brick stable. The fashion for the ‘Gothick’ during the late 18th and 19th centuries seems to have been popular with the inhabitants of Bergh Apton; Bluebell Cottage, Bussey Bridge Cottages (NHER 37725), Lodge Cottage (NHER 40366), Manor Lodge (NHER 48454) and Bergh Apton House (NHER 41151) were all built in a ‘Gothick’ or ‘rustic’ style in the 19th century. The housing development on Church Road (NHER 45758, 45885, 48609 and 48610) was constructed in 1951 by the Loddon Rural District Council in 1951. The houses formed part of the first phase of new village housing in Burgh Apton and they are excellent examples of their type. The completed scheme received a Civic Trust Award in 1957 and a Housing Medal in 1961. Sarah Spooner (NLA), 16 August 2005.